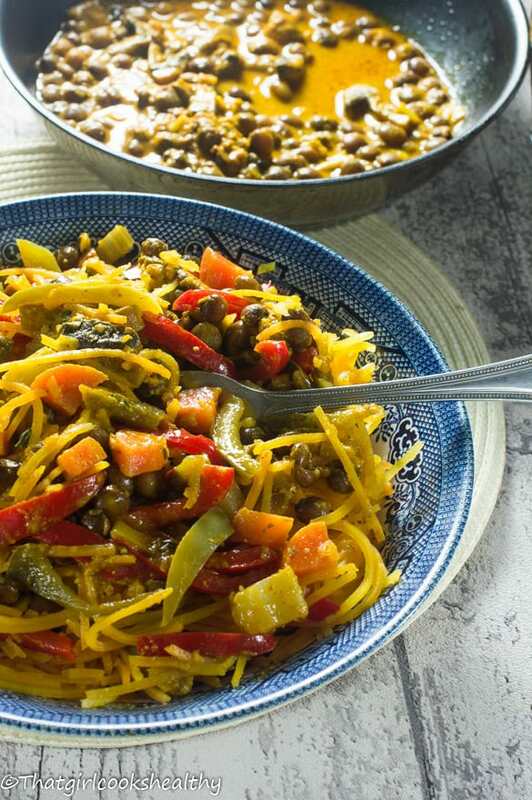 Gungo peas coconut curry recipe – A tasty healthy hearty pungent pigeon peas curry with an assortment of low fat nutritional vegetables. I think it’s about time that I treated you guys to another delicious, warm and hearty Jamaican meal with bold Caribbean flavours. 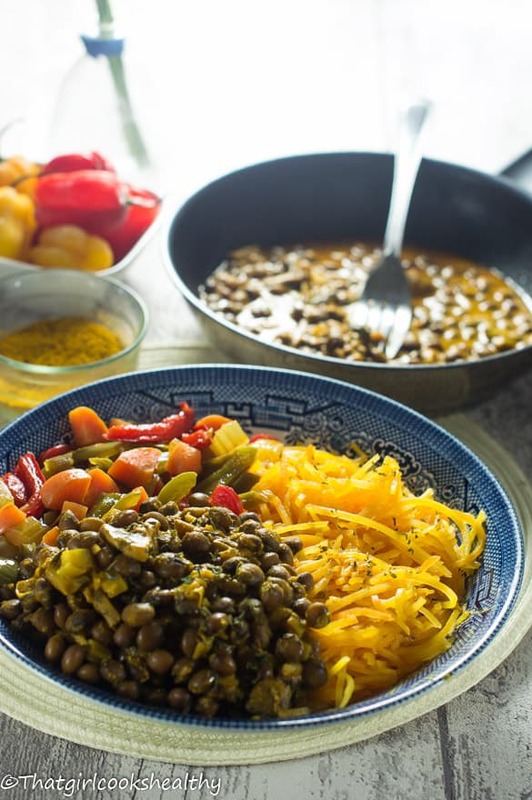 This gungo pea recipe is definitely timely especially with the cold snap that we’re experiencing, talk about comfort food and of course it has an element of Caribbean flare. Curry is something that Caribbean people widely embrace, our love for curry is attributed the Indian labourers who came over in their droves to help rebuild the infrastructure of the islands. Each island has their own methodology of cooking with curry, however I would say Guyana and Trinidad seemingly has a monopoly in comparison to their neighbours since they both have a greater number of Indian inhabitants. What Jamaicans call gungo peas other Islands like Trinidad and Tobago refer to them as pigeon peas. In some respect you can use the term interchangeably since they are the same thing. 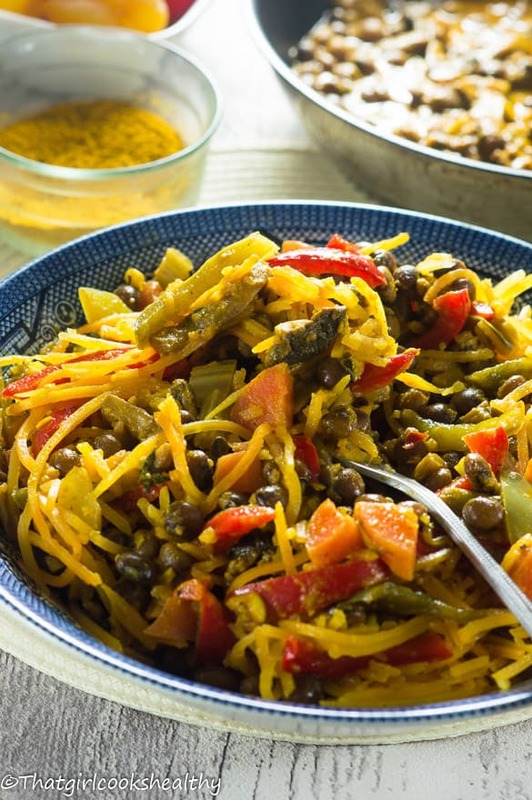 These legumes feature in quite a few recipes such as rice and gungo peas. 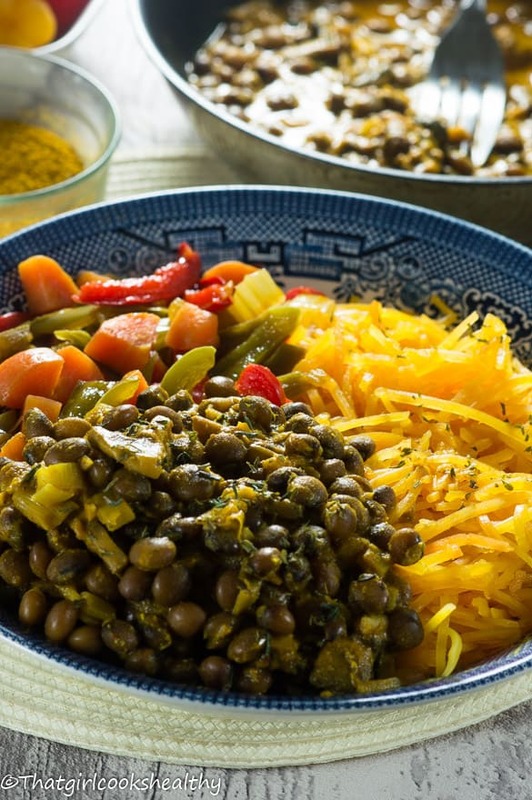 Jamaicans like to rotate between legumes with red kidneys or gungo peas being the preferred choice..
Don’t be alarmed if you have never hear of this legume before, you can purchase it from many places that has a high number of Afro-Caribbean or Asian residents. In the worst case scenario, black eyed peas make be a great substitute or another round legume will do. Although this recipe is vegan, if you want to put a carnivore spin on things then feel free to add some prawns. I personally like how it tastes using legumes and not to mention filling. Legumes are a brilliant source of protein, they expand in the stomach and take a while to digest. This slow releasing process helps to keep the body content and suppresses the appetite. The noodles are low in fat and made from vegetables, butternut squash to be precise, I have a spiraliser which creates excellent grain free noodles. Although, on this occasion I purchased them ready to use from Sainsburys. What if I cannot source any butternut squash noodles? Essentially you can either purchase pre-made noodles or use a julienne peeler or a spiraliser to make your own with whichever device you see fit. How long do gungo peas take to cook? I used dried peas which take roughly an hour to cook on medium heat. My reason for doing so is simply because I was raised using dried beans/peas and so it’s a hard habit to break. However, you don’t need to follow suit unless you want to. Canned peas are readily available to buy from the store and much more convenient to use. Alternatively, if you have a pressure cooker then feel free to cook the dried legumes, pressurised to speed up the process. Almost everything in this recipe is homemade or locally sourced for example, the veggies came from my families allotment. There’s a water soluble Caribbean vegetable called cho cho thrown in there (chayote/christophene) zucchini would make a viable substitute if you’re having trouble finding cho cho. The curry powder I used was using a recipe from my blogger friend Imma (I highly recommend including her curry powder). 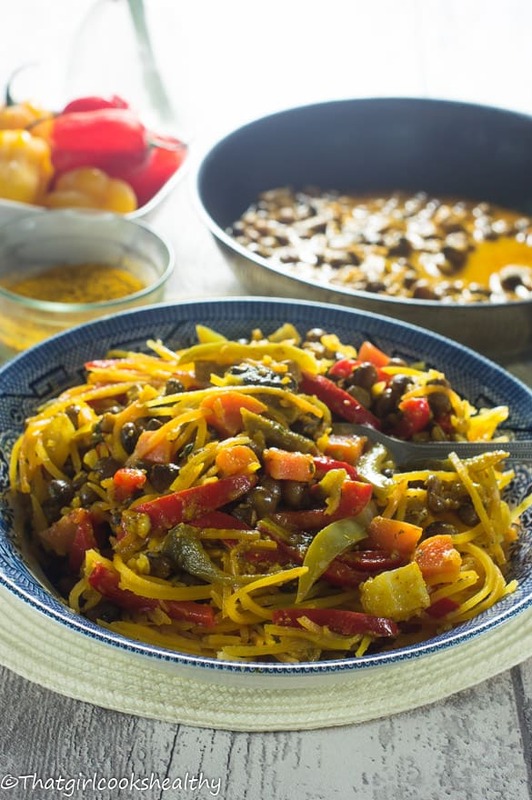 The true flavour is derived from the actual stewed curry pigeon peas since the vegetables are lightly stemmed and unseasoned in a pot separately. The curried peas are added towards the end where it completely penetrates the squash and veggies. Alternatively, you can merge the vegetables with the stewed peas instead, if you wish but I would suggest doing the aforementioned. Submerge the noodles with the chopped vegetables into a pot of boiling water. The water should be just enough to cover the vegetables, cover then stem on medium heat for 10 minutes until soft. Remove the veggies from the stove to cool before draining the excess water. Meanwhile melt the coconut oil in a frying pan on medium heat, then add the mushrooms, tomato puree, ginger, garlic, scallion and sautee for 1 minute before mixing in the curry powder. Continue to cook the curried ingredients before stirring in the coconut milk. The milky mixture should now bear a brown hue. Use a wooden spatula to mix everything once again before adding the gungo peas to the pan.. Combine and coat the coconut milk with the peas then season with thyme, pink salt and cayenne pepper or scotch bonnet.. Allow the gungo peas to stew for 10 minutes, during this time the liquid should reduce and thicken. You can add the remaining ingredients if you wish to immerse the entire dish in the coconut curry. This looks incredibly delicious. Yep, going on the menu for next week. Where would I find cho cho though? Thanks Whit, you can purchase cho cho from any African Caribbean or Asian grocery store. If you cannot locate any feel free to use courgette/zucchini instead as that would be a good replica. 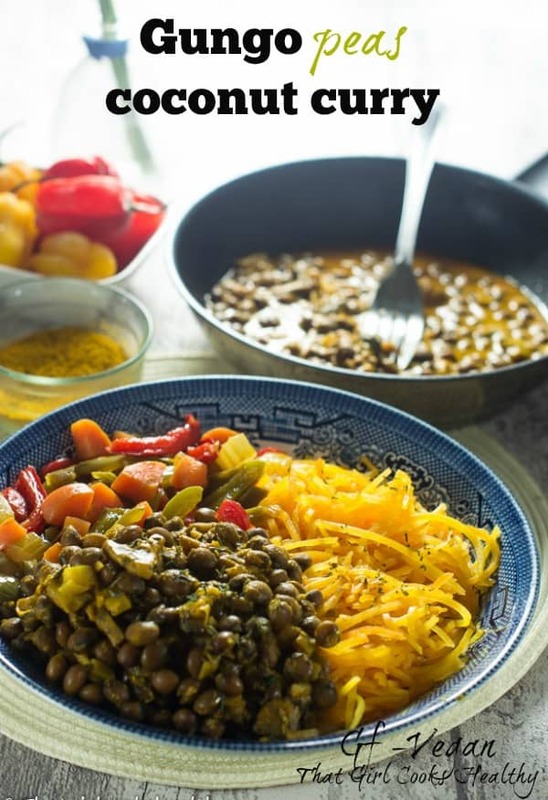 Pigeon peas are a favorite of mine and your recipe sounds amazing. I can’t wait to try it! I have been on the biggest pea kick lately! I’ll have to add this to my list for this week! That’s a really great looking dish. Great colors. 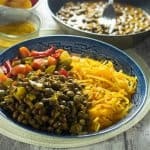 I think pigeon peas are so under-utilized! This sounds fantastic! Rebekah, I totally agree that’s why I try to incorporate them as a good source of protein. OH WOW! You really know how to take healthy ingredients and make it into a scrumptious dish Charlene. I would totally eat this any day of the week. Thanks for the shout out!! You’re welcome Imma. That curry powder is a keeper for sure and thanks for the compliment. What a delish vegan recipe!! I’ve been feeling for curry so putting this on the list! Got a sweat on, but lovely and delicious! Used dried pigeon Peas and courgette. Loving the feedback and thank you Janine. It was yummy. We like curry a little sweet and not too hot. I added a teaspoon of date sugar to the peas a a pinch of cayenne ( no scotch bonnets) . I used zucchini, cauliflower and carrots for the vegetable. I used the leftover coconut milk to to make some rice to go with the peas and vegetables! This was delicious! I didn’t have pigeon peas, so I ended up using lentils. I also used spaghetti squash instead of butternut squash. I was concerned the color wouldn’t come out right because I have messed up coconut milk sauces before (where it turned out white instead of brown), but your instructions made it easy to get the color right. It was so good! I will definitely be making this again! Thanks for the feedback Alyssa. I know Caribbean recipes can be tricky for some so I always try to make the instructions are clear as possible. I hope you try some more of my recipes when you can. I am definately going to have a go and cook this dish very soon sounds so tasty!